I wrote an explanation of the above graphic and was careful to save it as I went, and then published it, and the text had disappeared. Thanks blogger. So this is a re-write, which I will keep brief. The graphic above is my attempt to get a feel for Kidspiration, and also to compare it with its big sister, Inspiration. I wanted to get a feel for what we would be missing if we purchased Kidspiration for our Mac lab, instead of Inspiration. It turns out not much for our students (we are a pre-K through 8th grade school). Inspiration provides more formatting tools and export options, towards creating serious, quality presentations. 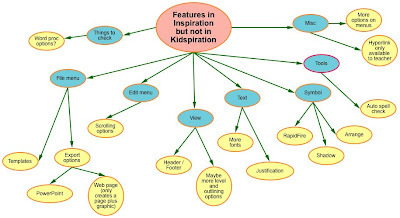 But Kidspiration provides the same basic concept mapping tools, and adds a lot of extra teacher friendly tools like the ability to create activities, and include teacher comments. It also includes a bundle of activities, plus some special math learning tools, including digital versions of pattern blocks, fraction tiles and base ten blocks. Our older kids (say, 7th and 8th graders) may be put off by the "kid" part of Kidspiration, but that can be worked around I think, while still getting the benefits of "visual learning". We did our first school-school video conference a week ago (12/5). Our Technology Magnet Cluster partner school is Kellman Elementary, near Sacramento and Polk. Shane Jonas, the lead tech teacher at Kellman proposed using Apple's iChat as an easy way to have students at the two schools meet. And guess what? It really was an easy, easy way to have the students interact. We recorded the Dvorak side of the conversation, and you can see it on the Dvorak website. Our building has a funky wireless infrastructure (only one access point on the third floor), and I ran into some network issues at the beginning (not shown on the video). It was a classic error of testing out the conferencing on the second floor, where the connection is strong (three strategically placed access points), and assuming that it would work the same on the third floor, and not allowing enough time to set things up on the third floor before starting the chat. Shame. Once we started the conference, though, everything worked just fine. The students were very patient. Kellman had a video camera with a Firewire connection, which seems to be a requirement for an external video camera for iChat. This allowed the Kellman side to be much more flexible with the video (though this is hard to see on the video). We used the built-in camera on the MacBook (only USB cameras here), so the students had to scrunch together so that they could all be seen by Kellman, and the Dvorak teacher, Ms. Minter, had to remember to step in front of the MacBook to be seen by our camera. Ms. Minter's classroom has a wireless "audio enhancement system", which amplified the sound nicely for the microphone in the MacBook and enabled the Dvorak students to also easily hear the Kellman students. Kellman used an external microphone; I'm not sure how they did the audio. Except for the initial technical difficulties, I think it was a very successful first time out. The students seemed fascinated by the whole thing, and there are a lot of possibilities for this kind of interaction and collaboration going forward. For next time: Allow more time for set-up and pre-conference testing; also help the students understand the importance of preparing remarks ahead of the conference. The link below goes to a project I had to do as part of my work towards a technology specialist certification through National Louis University. The project lays out setting up a thin client computer lab using Edubuntu. I am excited about the possibilities of this: it is cost-efficient, it saves on labor time; it extends the life of otherwise obsolete desktop computers; and it taps into the growing open source movement and the great software coming out of that world. Of geeky techno interest might be the last appendix, where I describe creating a mini-thin client set up on my Macintosh laptop (Macbook), using VMWare Fusion to create a virtual environment inside which I installed Edubuntu, and then used the Ethernet adapter and the Airport adapter as my two network interfaces. The wired connection went to a switch into which I plugged an aging Dell laptop which served as my thin client. And it worked! Maybe the technical details will be useful to somebody out there. It is a PDF, and on the fat side -- almost 1mb -- pictures! Here's my part to promote the 2008 "Give One Get One" (aka G1G1) program (aka G1G1 2008) of the One Laptop per Child (aka OLPC) project. The program begins 11/17/2008; orders are being handled through http://www.amazon.com/xo. Join our community mailing list, grassroots@lists.laptop.org, to discuss how to get the word out about the new campaign. Blog it, add a comment about it to every article about OLPC and the XO. * Social site updates -- Facebook, Twitter, MySpace : there are OLPC accounts on many of these sites which need maintenance and regular updating. For instance some 2007-era badges and promotions need to be updated to link to the Amazon site. * Viral marketing. Put http://www.amazon.com/xo in your e-mail signature. 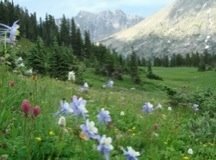 Mention G1G1 in blog posts. Comment on misinformed or incomplete articles online, and include the link and the date, Nov. 17. Our use of technology at Dvorak is moving along much faster than this blog would suggest. I will try to update the blog more often! Below is some text that accompanies a three minute rough video that I put on our website (dvoraktech.org) about the use of the Turning Technologies TurningPoint audience response system that we are using in some of our classes. This clip shows the use of the TurningPoint audience response system in Ms. Minter's 7th grade class. I think this clip is interesting for a couple reasons. First, although the PowerPoint slides are pretty basic, they indicate the best practices of a master teacher: Ms. Minter took the initiative to see how the "clickers" (which is how the response system has come to be known) would work in her class. The slides only had A, B, C and D on them, but this worked because the students were given a text to refer to (last year's benchmark assessment test booklet). The students were given the question number; answering the question involved some reading and referring to the test text. It was exciting to see a teacher take up the new technology and play around with it to see how it would work in practice. Ms. Minter came up with a simple, workable -- and successful -- way of putting brand new technology to use. Second, Ms. Minter and I were surprised to see how engaged students were with the clickers. This is evident in the clip when they start doing the New Year's Eve countdown, and their response when the correct answer is shown. I'm not sure why the clickers are so popular -- perhaps it is a combination of the instant feedback and recognizing oneself as being part of a group. I am still looking for an existent technology curriculum matched to the ISTE standards. I want something that shows performance descriptors for different grade levels -- i.e. much more detailed than what I could find on the ISTE site. It's hard to believe that school started here in Chicago five weeks ago. We (me and my co-Lead Teacher) have been busy working on several fronts to get the Technology Program going at Dvorak. We have our laptop cart set up with 30 MacBooks, and are going to the selected classes twice a week for about an hour at a time. We have been focusing on basic computer skills and getting the students used to using FirstClass, the sprawling server-based application provided by CPS to its students. FirstClass provides not only a safe email client for the students, but also discussion areas, calendars, file storage, link libraries and more. We are also working on getting the new website set up (dvoraktech.org), trying to get all of the existing equipment in a working state, working w/ the teachers on incorporating their laptops and LCD projectors into regular instruction, figuring out for ourselves how the new gizmos work, and more.